Candied citrus peel, usually from orange, lemon or grapefruit, is commonly found in baked goods such as fruitcakes. Orange and grapefruit in particular are also served as confections to eat on their own and are especially popular around the winter holidays. Lime peel can be candied, but you will usually find the three aforementioned. You can make your own candied peel or you can also purchase it. In upscale candy stores you might find elegant, long slivers of peel similar to our homemade recipe. 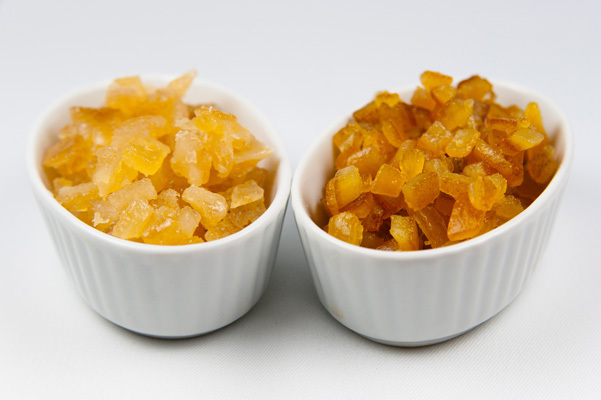 When purchasing for use within recipes, you will most commonly find diced candied lemon or orange peels as seen in the image above.